When the state Department of Transportation studied removing the lightly-used Sheridan Expressway, it considered two scenarios. One predicted conditions with the Sheridan kept as is. The other imagined closing the highway to traffic without making any other changes — simply fencing off the 1.25 mile structure. Making a decision about the Sheridan’s future by comparing a traffic-carrying highway to an empty-but-still-standing highway was clearly inadequate, so with the help of a federal TIGER grant, New York City has launched a comprehensive and holistic study of the area. The new study includes not only an expanded transportation analysis looking at the area’s broader highway system, but also issues like access to the Bronx River, which is cut off from neighborhoods by the Sheridan, and the development of housing and jobs. That study is now well underway, and after some initial bumps, advocates for replacing the highway with new development are feeling encouraged. So far, the city has already hosted an introductory meeting of the large working group set up to bring together stakeholders like elected officials, local activists and residents, businesses and city agencies. Walking tours of the neighborhood are being next Thursday and on August 20 (you can register by e-mailing sheridan_hp@planning.nyc.gov). The Department of City Planning has also set up a website to provide updates on the study and put information about the project in one location. Ashwin Balakrishnan, the coordinator of the Southern Bronx River Watershed Alliance, acknowledged the broad scope of the study so far. “If you’re just looking at it from a transportation perspective, as the state DOT was, you’re not going to have any benchmarks or expertise for how it’s going to be benefited by other land uses,” he said. Including agencies like the Department of Parks and the Department of Housing Preservation and Development, which are both now part of the working group, provides “more expertise and more breadth,” he said. Even the city’s transportation analysis, said Balakrishnan, should improve on the state’s efforts. 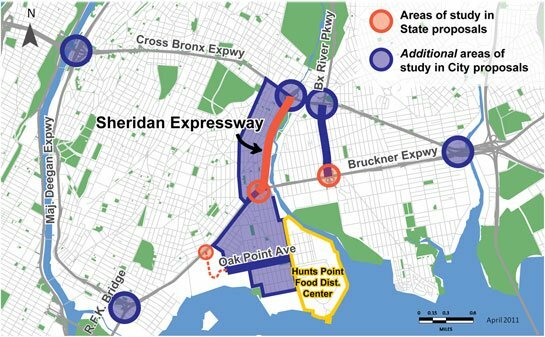 Whereas the state studied only the Sheridan itself and two interchanges on the Bruckner Expressway, the city is studying a number of other highway exchanges as well as local roads near the Sheridan and the Hunts Point market. That means the city can study, among other alternatives, whether trucks headed to the market from New Jersey could take the Major Deegan to the Bruckner and then use new off-ramps headed directly to the market — planned whether the Sheridan is removed or not — rather than the Sheridan. Moreover, the state’s data are eight years old, while the city is collecting new data now. Perhaps most encouragingly, the DCP website promises that the city’s plan will include “a comprehensive cost-benefit analysis of different options incorporating traditional and sustainable measures.” So the high cost of maintaining a highway will figure into the city’s calculations, with the social and economic benefits of new housing, jobs or parks figuring into the other side of the ledger. That said, Balakrishnan also worried that the un-quantifiable benefits of replacing the Sheridan with development — things like better walking access to the river, which one might lump together under “quality of life” improvements — could still get short shrift. “The things that are harder to study are often devalued,” he said. When the study and community outreach were just beginning a few months ago, advocates were less impressed with the city’s approach. As reported on Mobilizing the Region yesterday, early outreach efforts gave little emphasis to features like the new off-ramps to the Hunts Point market. Those off-ramps and other highway improvements, which are part of all remaining options for the area, are essential to maintaining business support; the Hunts Point Food Distribution Center directly employs 10,000 people and the cluster of food businesses surrounding it tens of thousands more. wow. dare i say… i am optimistic?